The What: Peerless-AV has added two new Heavy Duty Universal Projector Mounts (PJR125 and PJR125-POR) to the its range of mounting solutions. Designed for use in applications including corporate, education, home entertainment, retail, live event, museums, and theme parks, the Heavy Duty Universal Projector Mounts support a wide range of projector models, including laser projectors, large venue projectors, and heavy LCD/LED projectors. 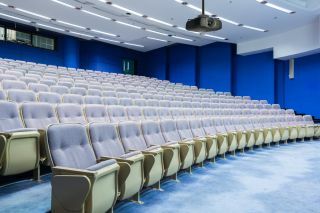 The What Else: Offering what the company calls the "largest mounting pattern in the industry," the mounts also accommodate projectors weighing up to 125 lbs. The Bottom Line: Peerless-AV’s projector mounts feature a low-profile design and simple Hook-and-Hang feature to help installers when securing the projector and making adjustments. The mounts include six universal legs (four pre-installed) that provide additional support for projectors with more than four mounting holes and are completely adjustable. Peerless-AV’s Heavy Duty Universal Projector Mounts (PJR125 and PJR125-POR) are available now through Peerless-AV direct sales representatives and authorized distribution networks.